What's the current draw and supply voltage tolerance? What's the current draw when the Raspi is at idle (min), and at 100% CPU/GPU (max)? What's the minimum and maximum voltage allowed to run the Raspi stably? It shows that power drainage is variable, depending of the connected devices. Tests never reached 700 mA. Max was 515 mA. 322mA at 5.09V - at login prompt on Arch, idle CPU, nothing plugged but power (1.64 Watt). 322mA ~ 323mA - only power, no IO, (peaks at 350-390mA when CPU solicited). 377mA - ethernet and composite video (compared to 375mA without video composite). 386mA - Mouse&KB + ethernet and idle CPU. 389mA - Mouse&KB + composite video + ethernet at idle CPU. 394mA - CPU idle, LXDE/X11 on!, composite video, ethernet, PS2 KB&Mouse together on one USB port. 435mA ~ 465mA - ethernet only, CPU stress test with ethernet only with 'stress --cpu 8 --io 4 --vm 2 --vm-bytes 4M --timeout 20s'. 440mA (peaks @ 480mA) - Mouse&KB + composite video + ethernet with CPU stress. 475mA ~ 515mA - LXDE/X11 on!, composite video, ethernet, PS2 KB&Mouse together on one USB port, mouse in use + CPU stress, LXDE/X11 on. Mouse & KB: draw 28mA when idle, to 80mA when mouse in use + 7 to 8mA per keyboard LED when on. Voltage is generated by this device and measured by this meter. 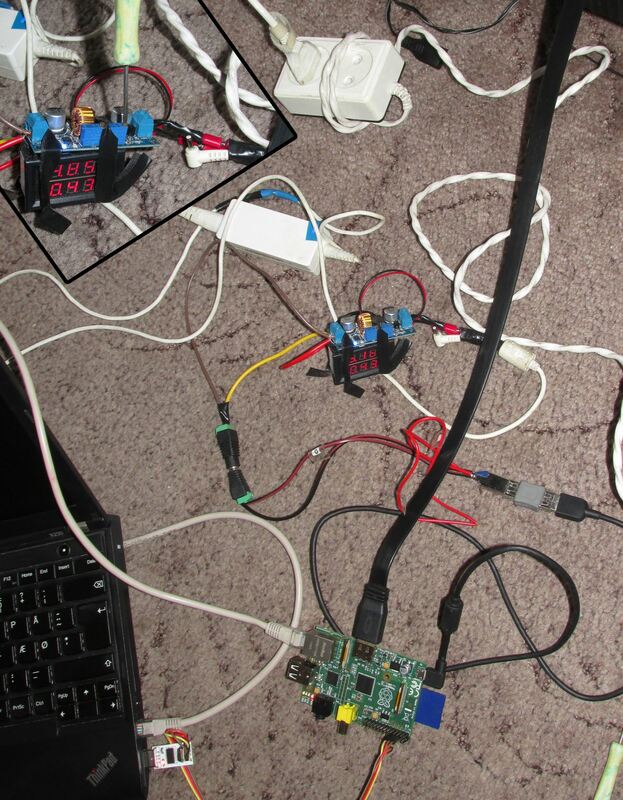 I started Raspberry Pi with Ethernet and HDMI connected, with usual Raspbian "2014-06-20-wheezy-raspbian.zip" on SD-card. Nothing is connected to USB ports. I started from 5.15V and decreased the voltage gradually, checking how the device is working (using UART to starts things there). Without USB devices, it works more or less stably even at 4.1 volts. The last voltage where Ethernet gets available after booting. and power usages drops. `lsusb` shows only one line. I've seen no state where HDMI fails while CPU still works. It reboots after trying to load USB modules or something. Short conveniently placed 5V pin and 3.3V pins together. need lucky undervolting-friendly devices (or probably a powered hub). Probably near the lowest voltage where USB and LAN may still work. 2.85V 0.22A "Disabling IRQ #32"
even can't load the Linux kernel back. Still can't boot, probably rebooting instead of initializing USB. Decreasing voltage after the boot has finished. Gradually decreased voltage to this after fully booting. Short bootloop on attempt to load CPU with "yes > /dev/null". Note that protection fuse is also bypassed in this mode, so the risk of rendering the board nonfunctional is higher in this setup. The model B requires 700 mA at 5 V. That's the maximum for the overall board. The A is 300 mA. USB is +/- 5% so 4.75-5.25 V. Since this includes 2 x USB; the board itself is 500 mA. While USB can be up to 500 mA, a device must request that; otherwise it gets the default 100 mA. With the exception of 1080p playback, I took the measurements myself with a lab power supply, so I can verify their accuracy. No USB devices (keyboard/mouse) were connected. Neither was HDMI, but I suspect the HDMI output was still running. Interestingly my PS/2 keyboard (connected via a USB adapter) was rated at 75mA but only increased the power draw by 10mA. 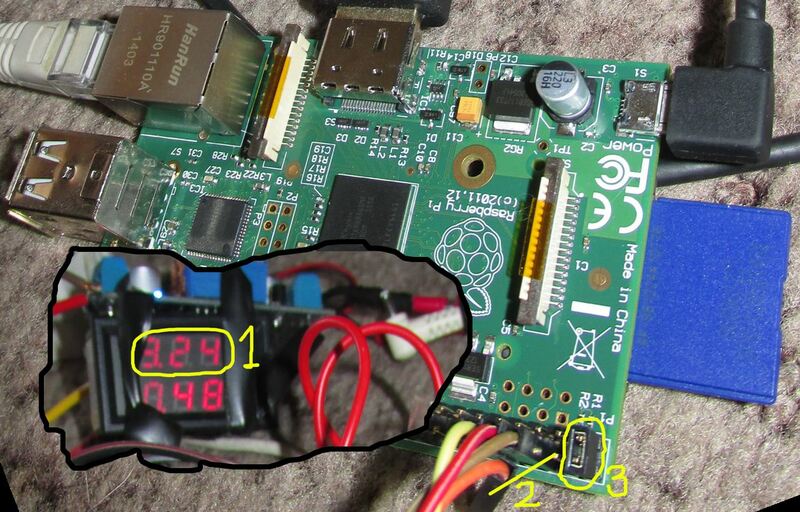 If you don't want to click links, the Raspberry Pi can handle 4.75v to 5.25v. Take note that some of them have a bit of give-or-take. The model A and B require 300 mA and 700 mA (respectively) maximum for the board on it's own. The board requires USB power, which is 5v ± 5% - 4.75-5.25 V.
The RPi has limited voltage regulation so do not go outside this threshold! What do I need to know to power from batteries? Will a Duracell 9V battery power my Raspberry Pi for 24 hours? Can I power Raspberry Pi (newer models) from 3.3v Supply Alone? How do I interpret the Volts and Amps on my Raspberry Pi Power Adapter? With the Pi Zero W plus a 2.4A adapter, can I safely draw up to 2A from the 5V pin?